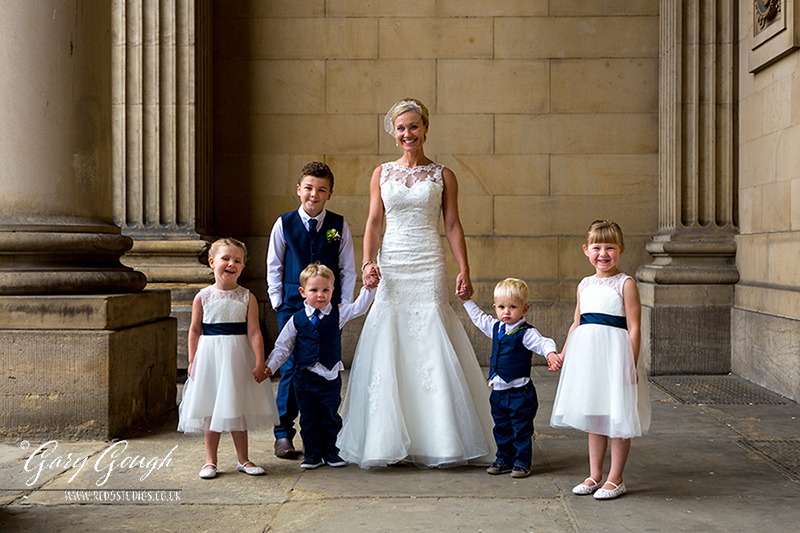 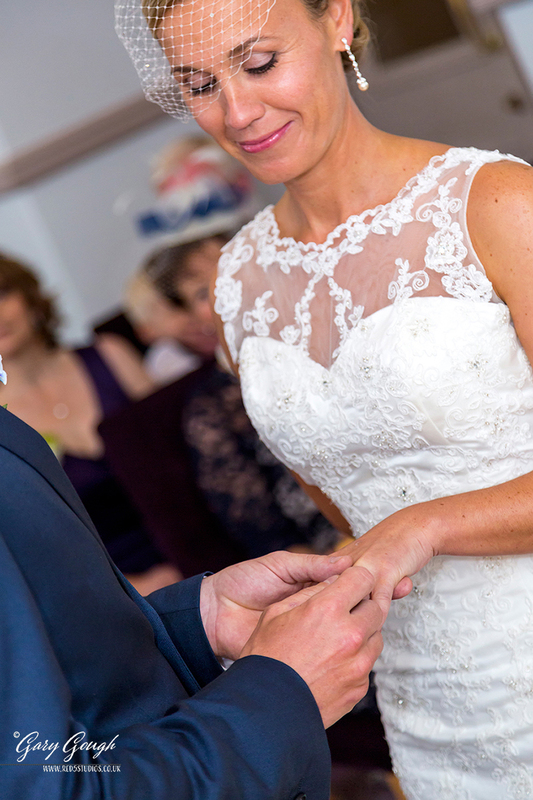 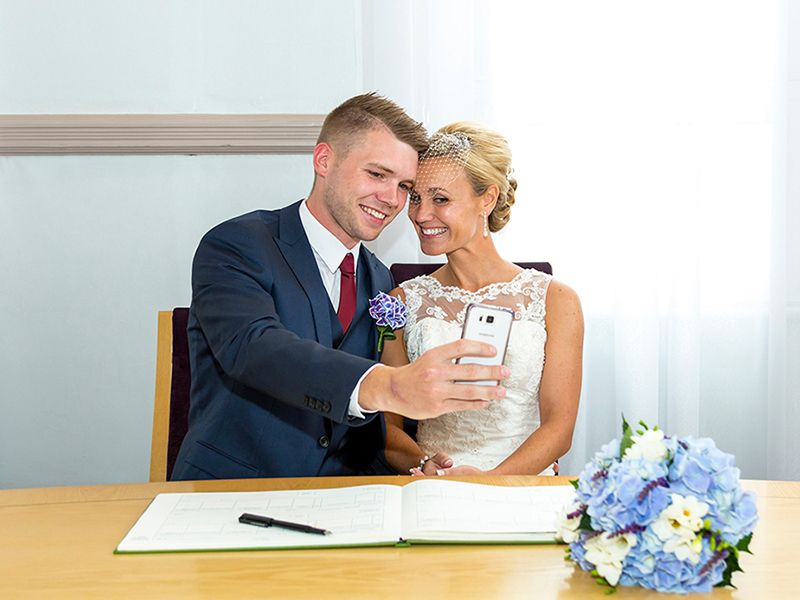 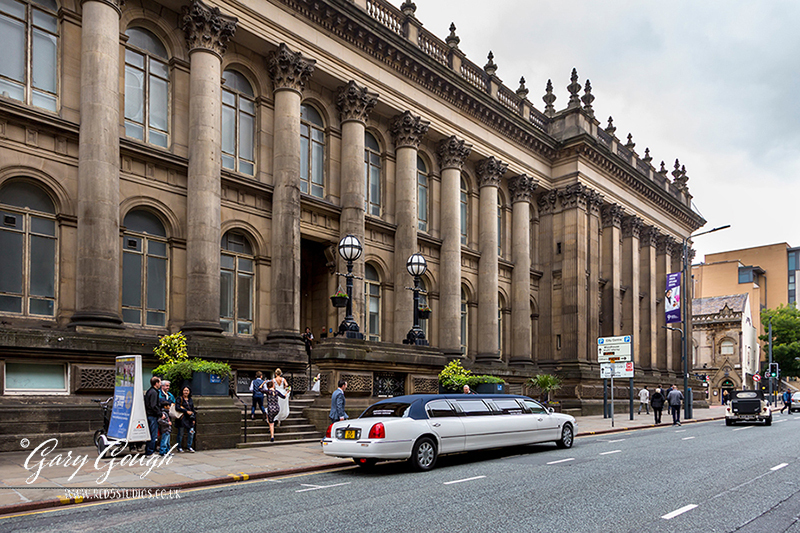 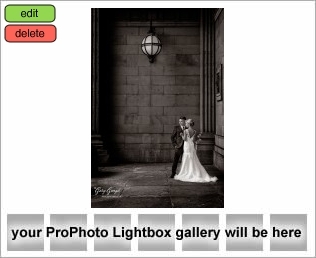 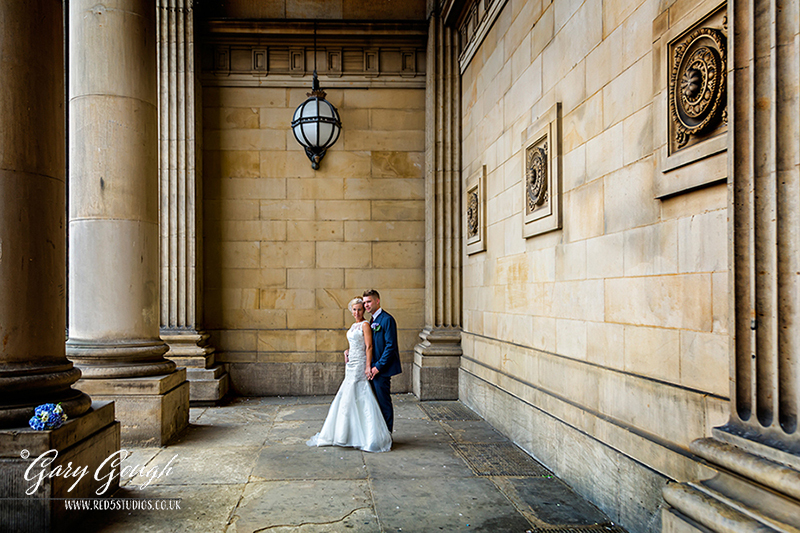 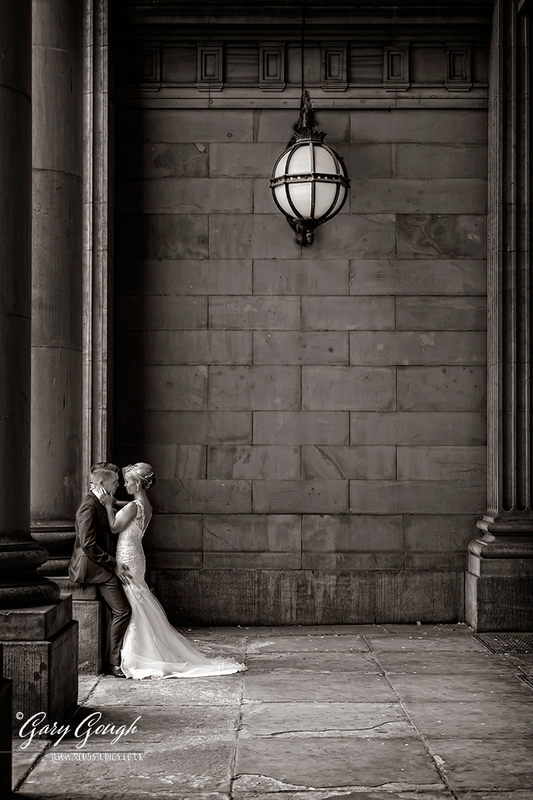 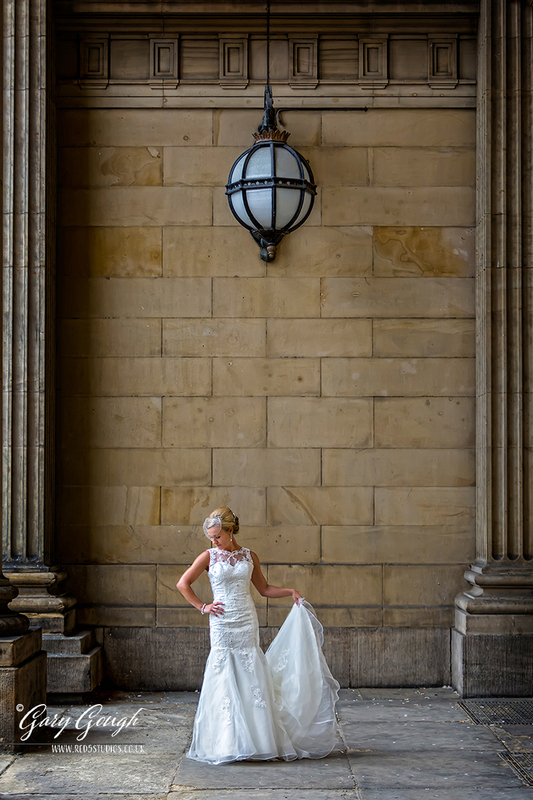 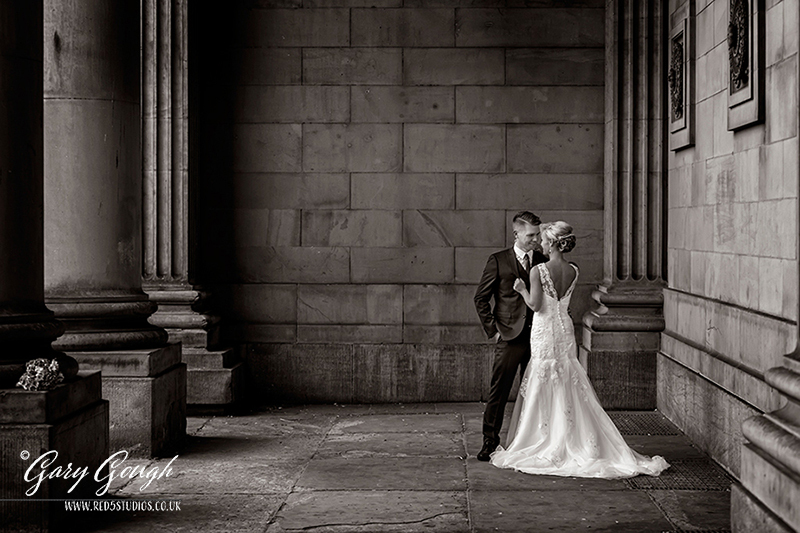 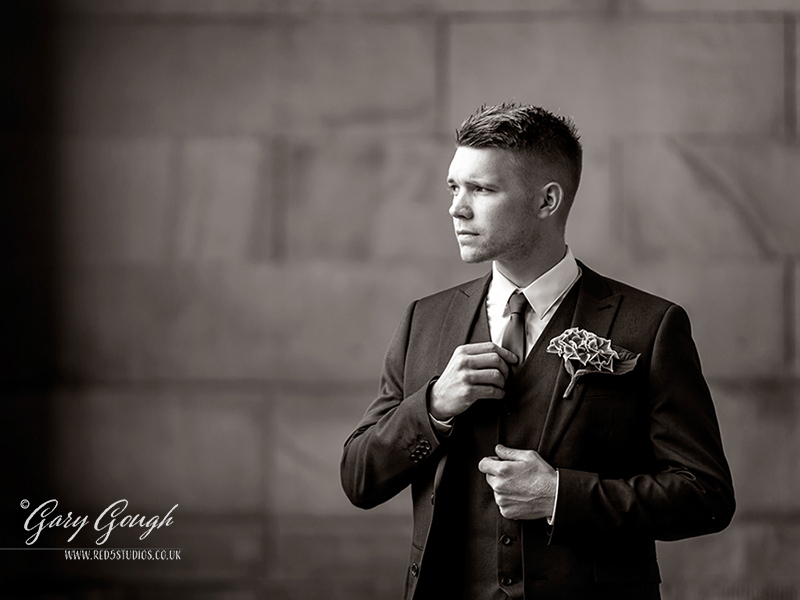 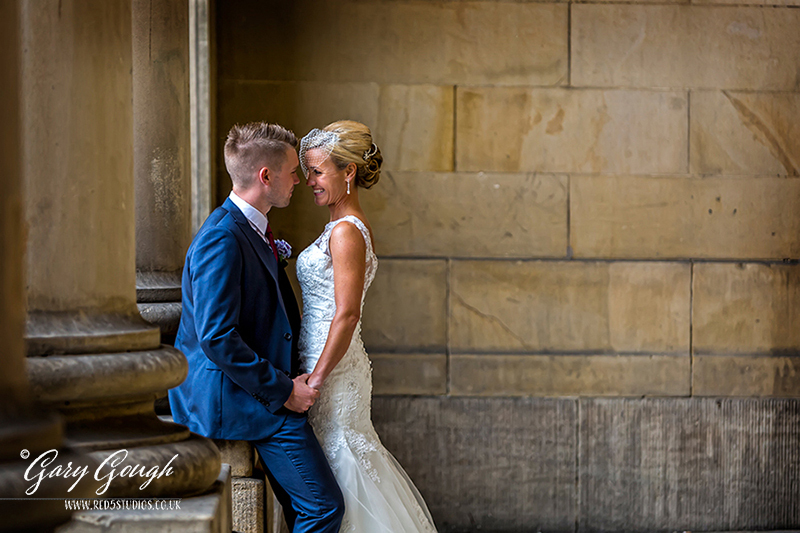 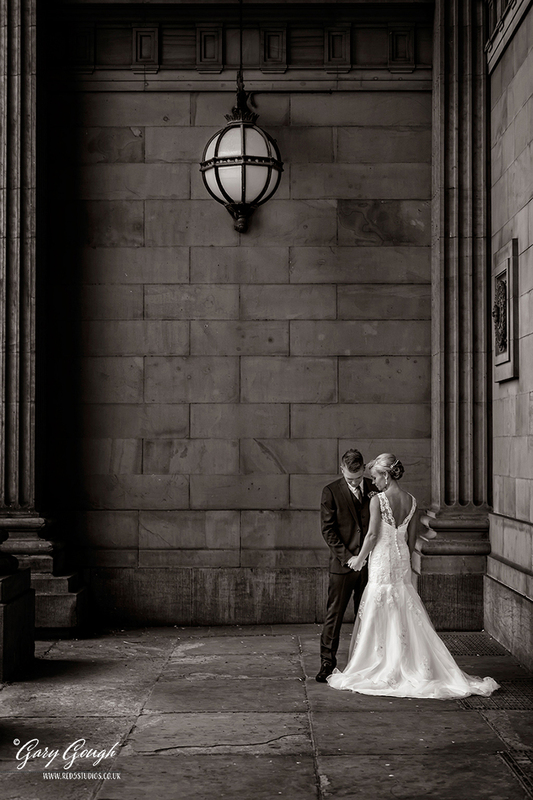 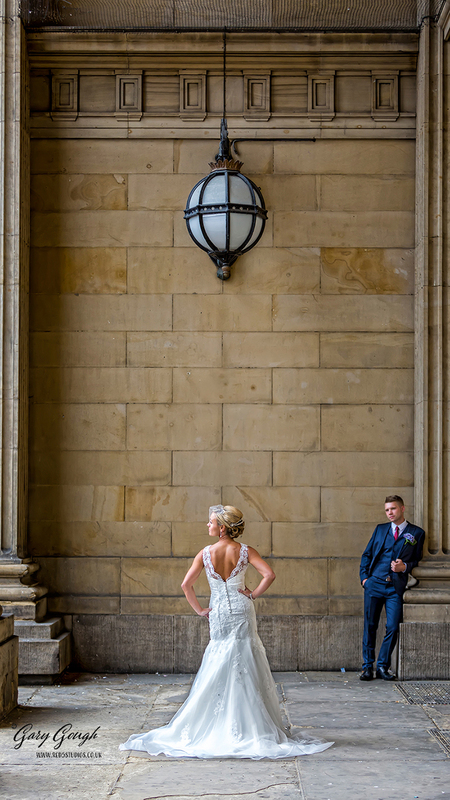 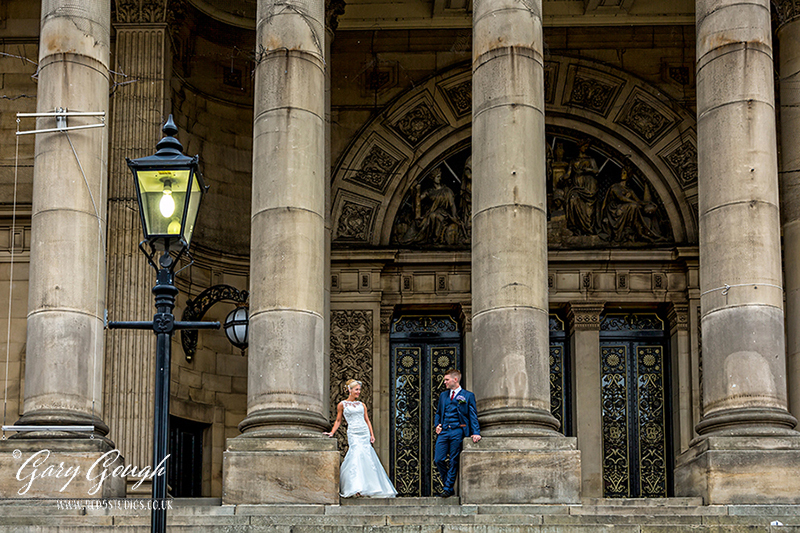 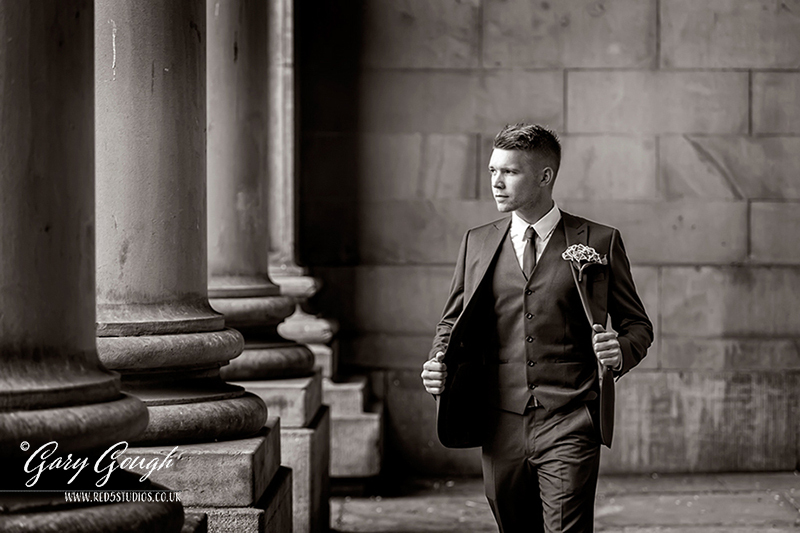 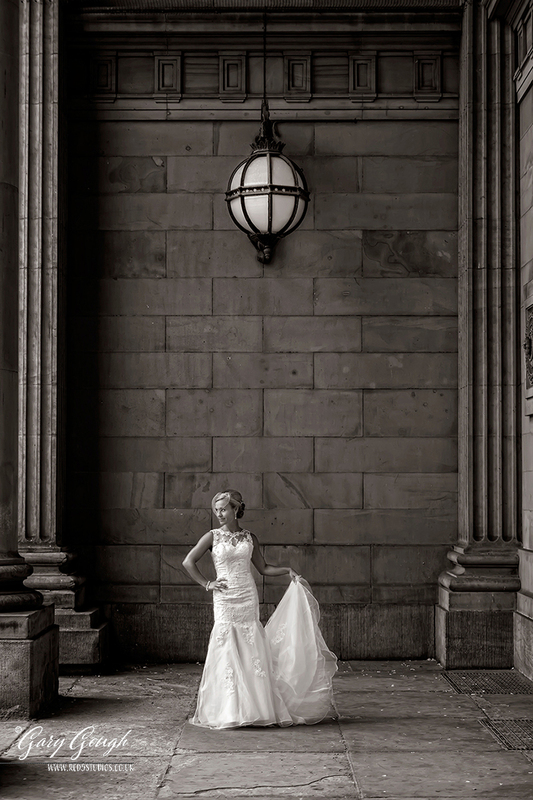 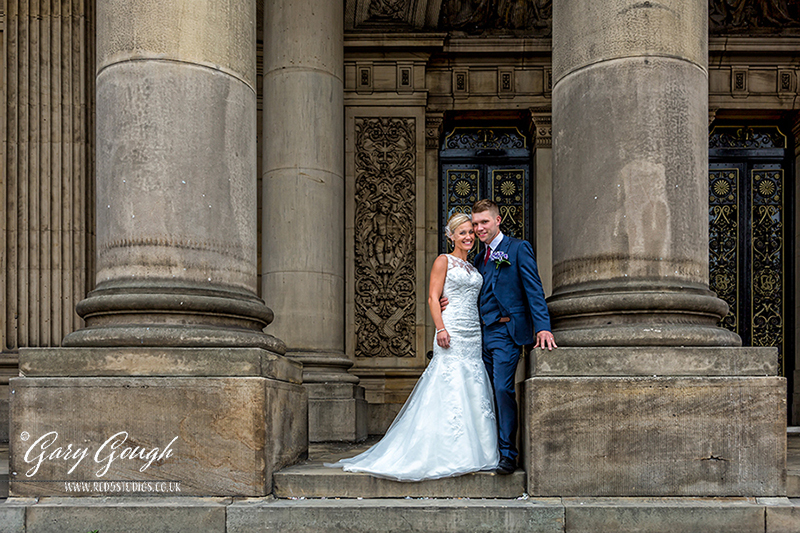 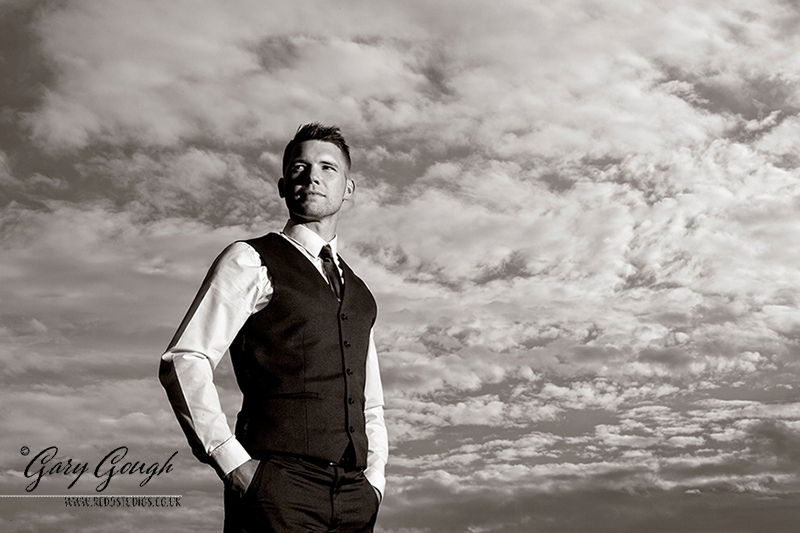 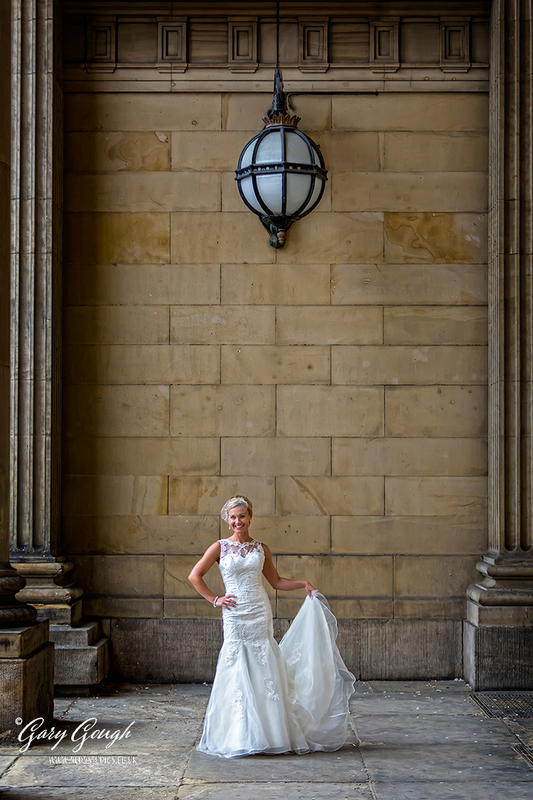 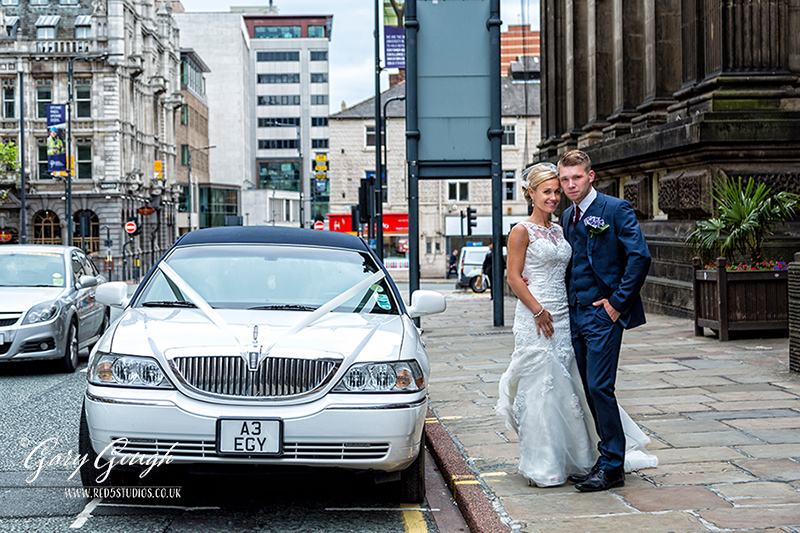 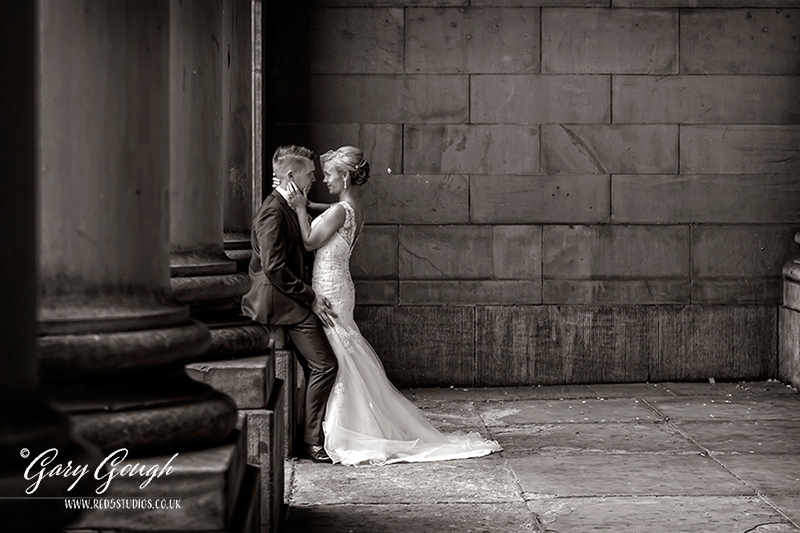 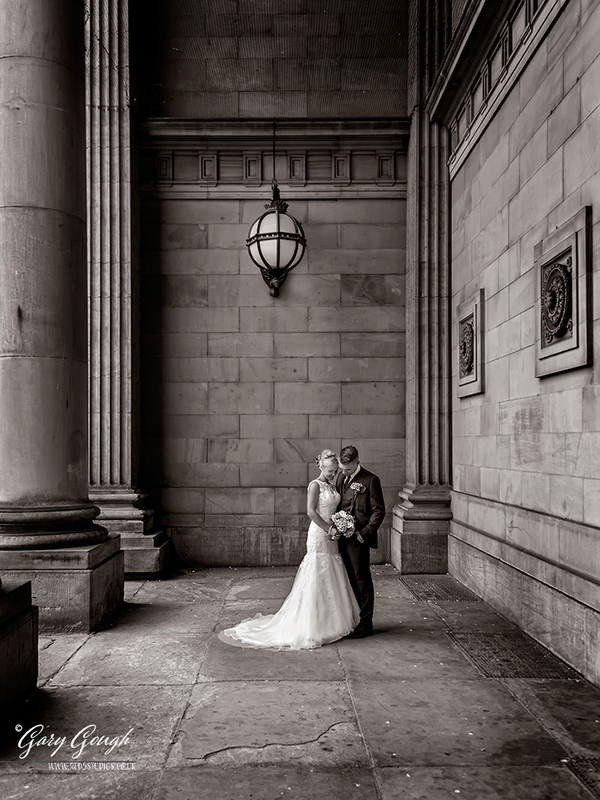 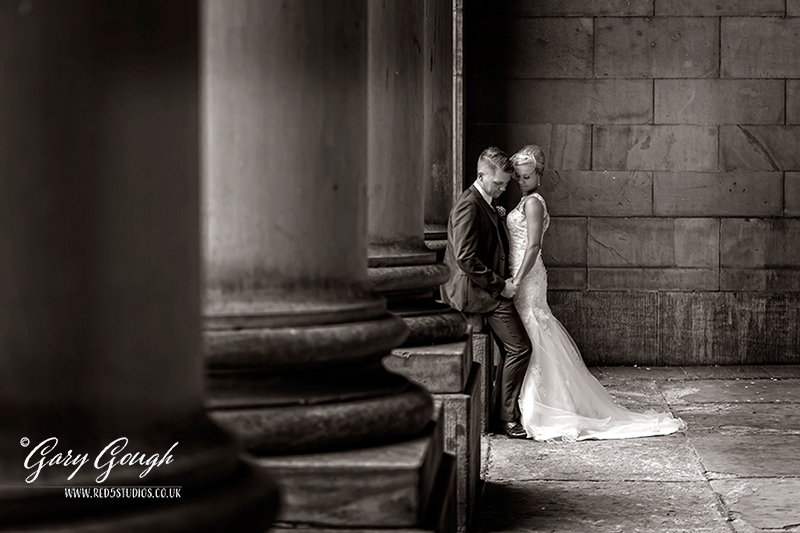 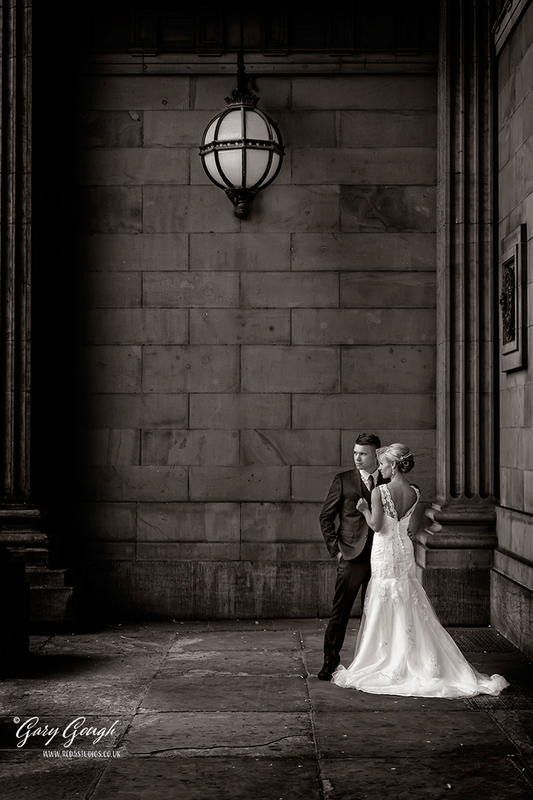 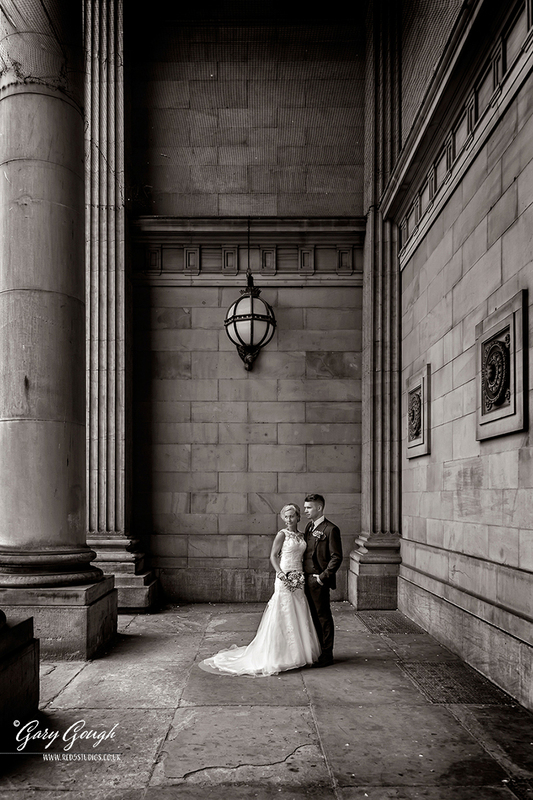 Nicola & Sam were married at Leeds Town Hall. 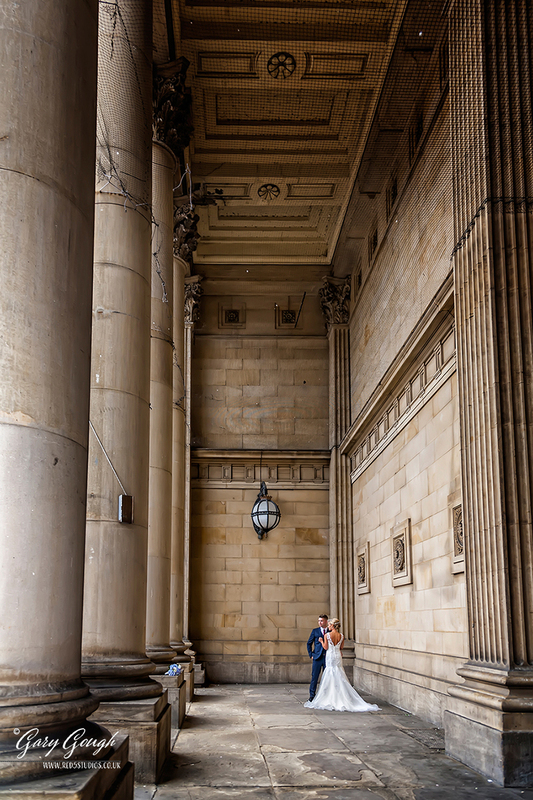 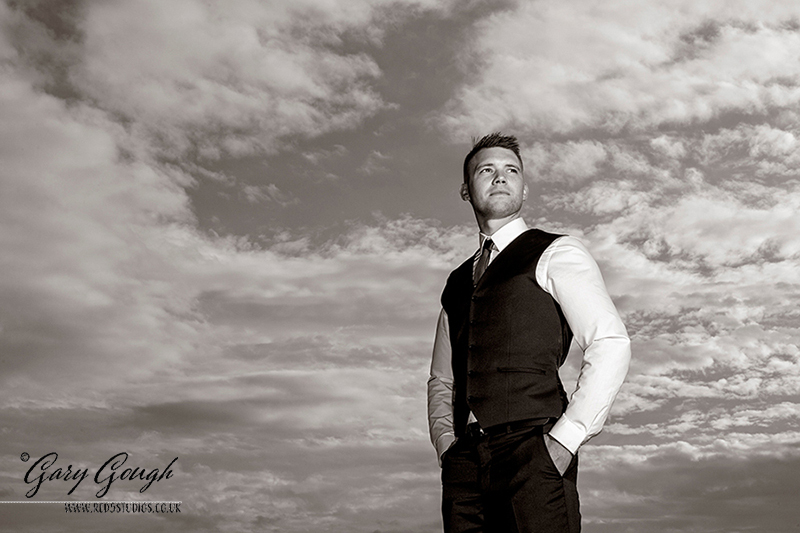 Today was going to be a very busy day: we had three different venues to visit and each offered us a great location for photos. 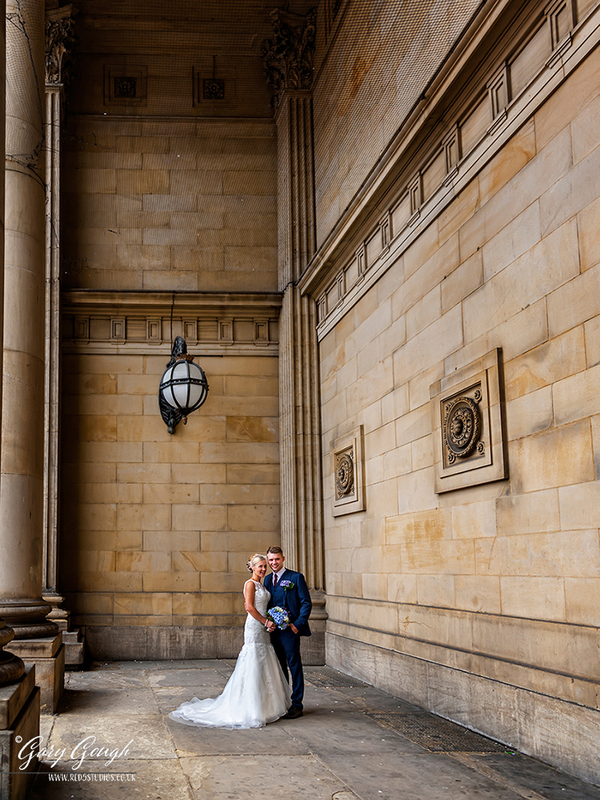 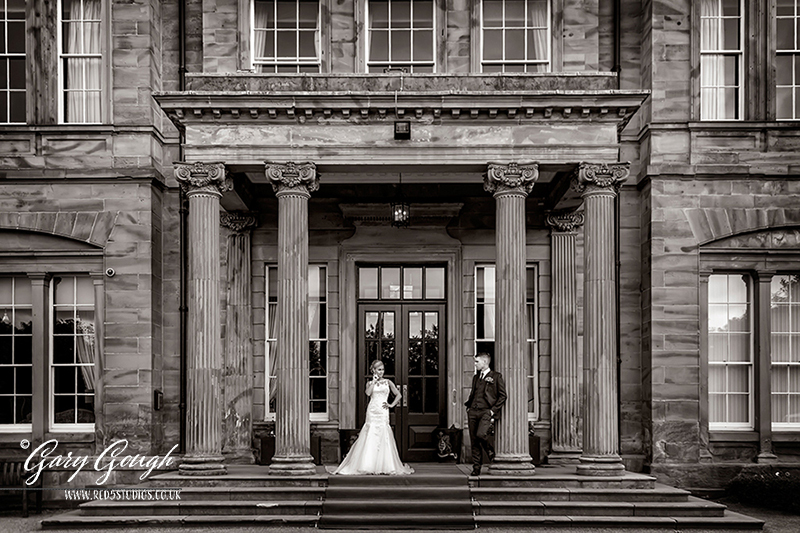 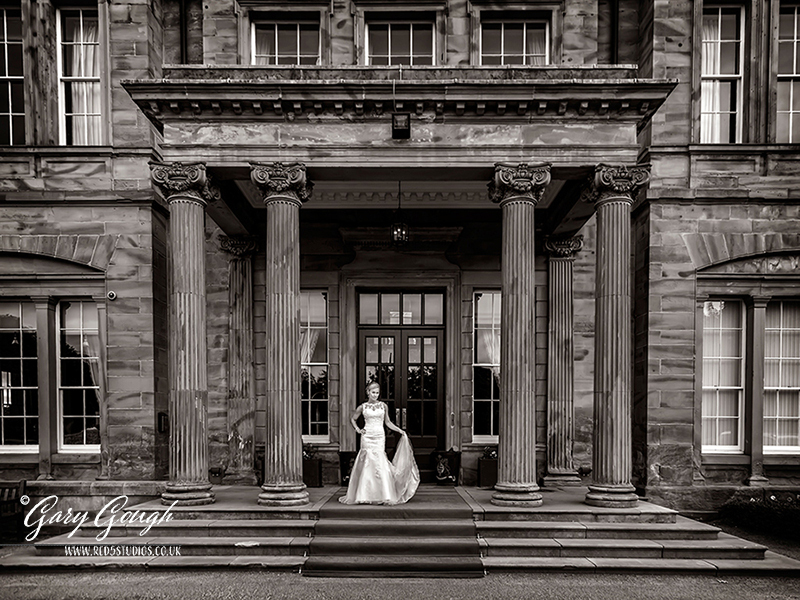 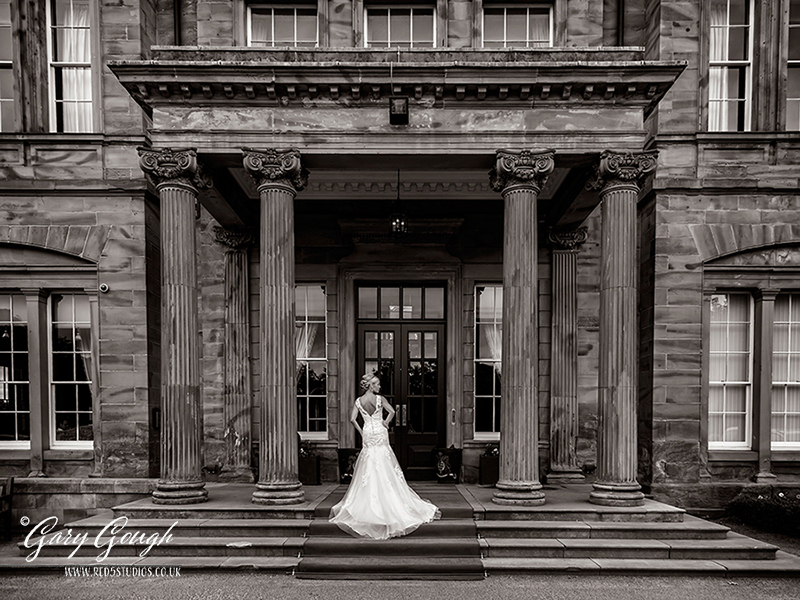 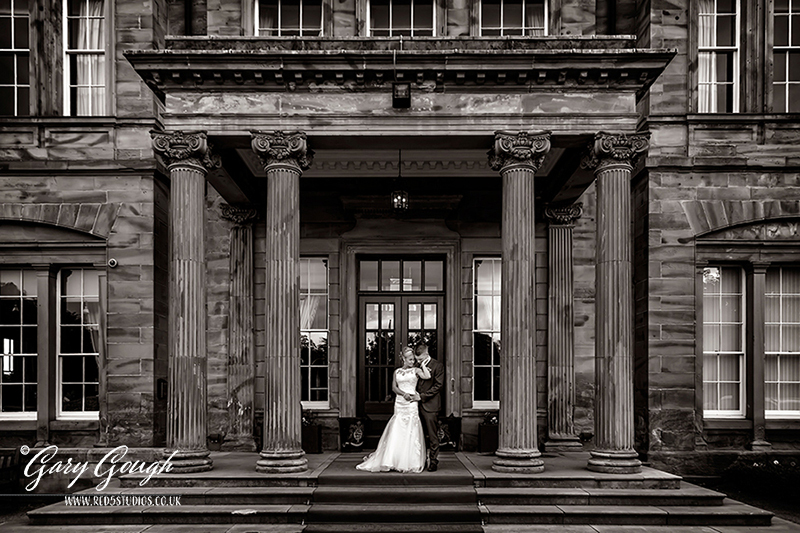 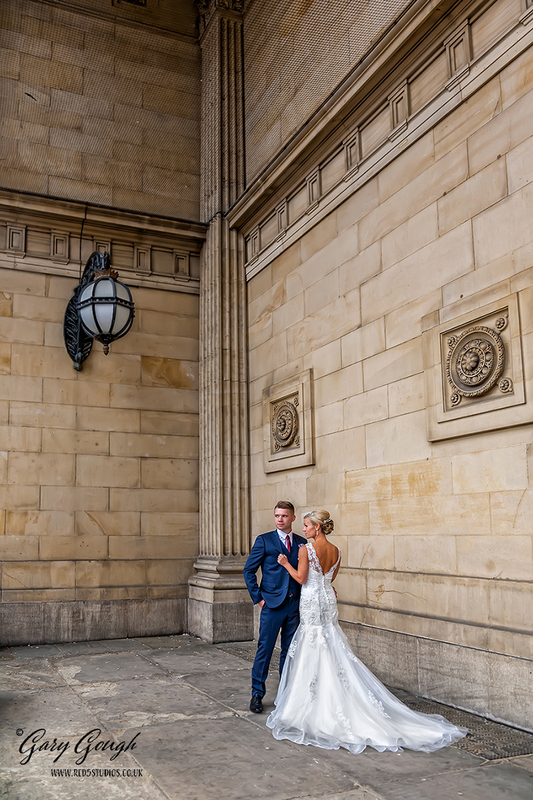 The facade of the Town Hall is very impressive, its huge sweeping staircase, elegant pillars and large ornate iron doors were all great backdrops for some of Nicola’s & Sam’s Classical shots. 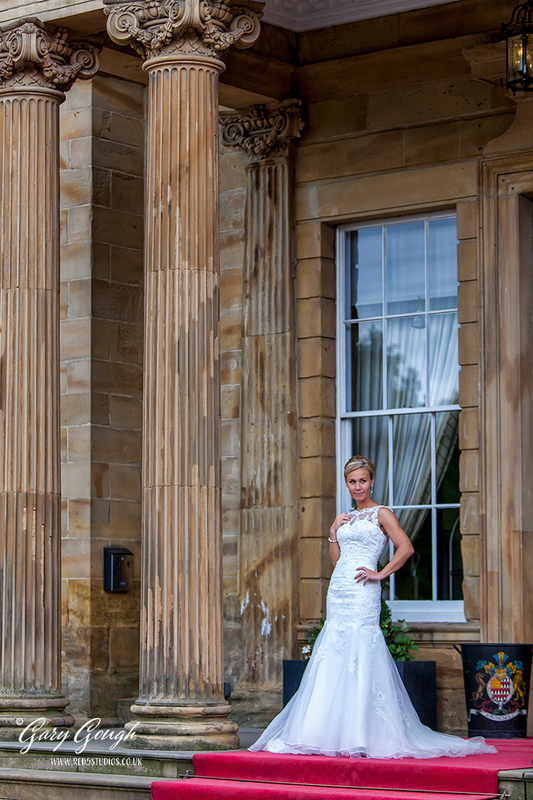 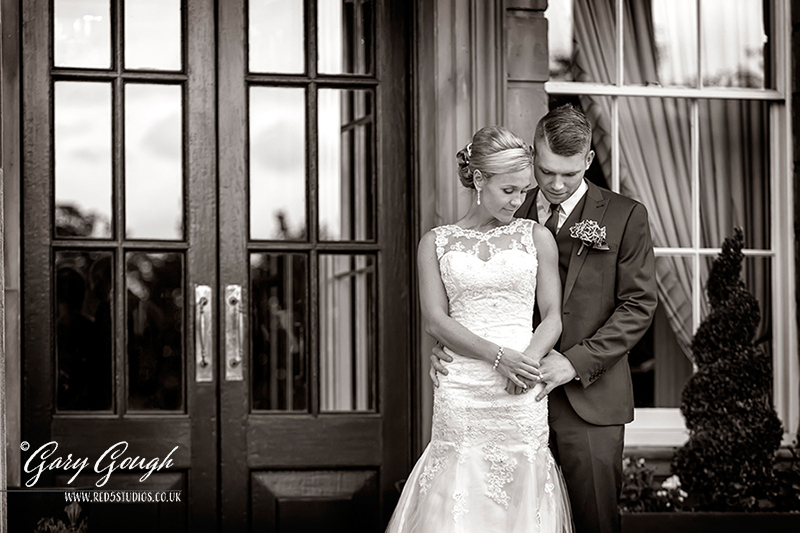 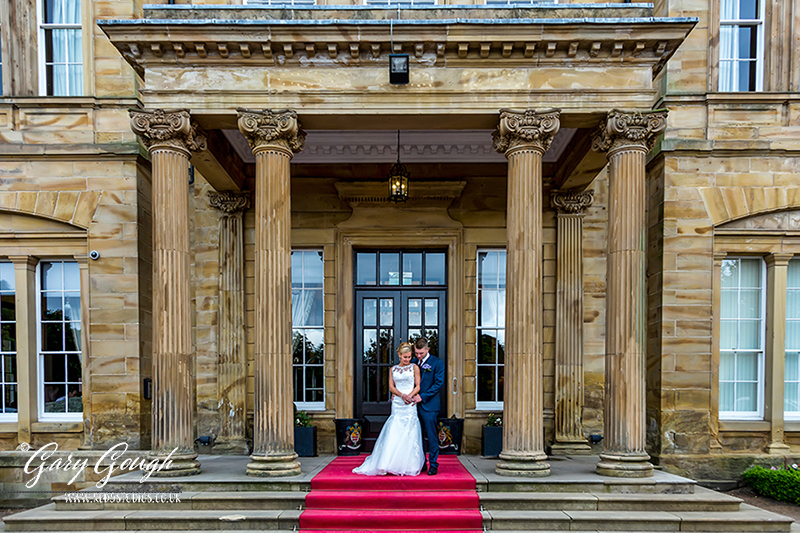 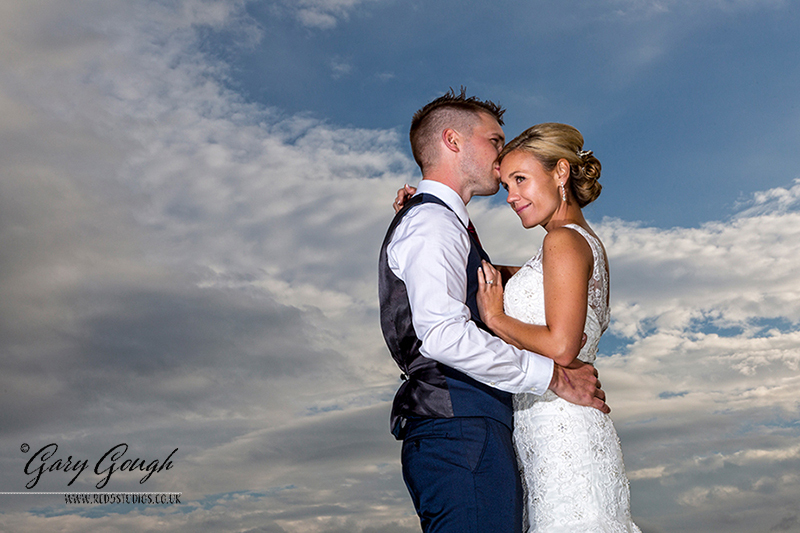 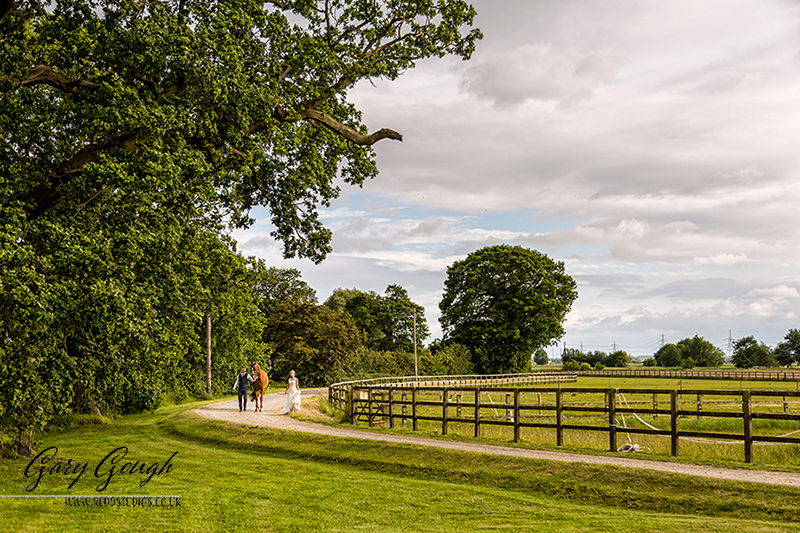 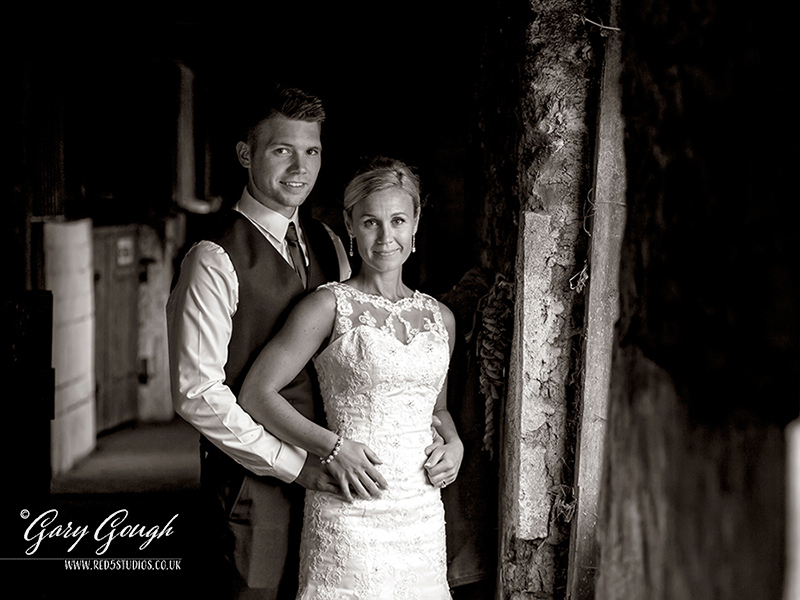 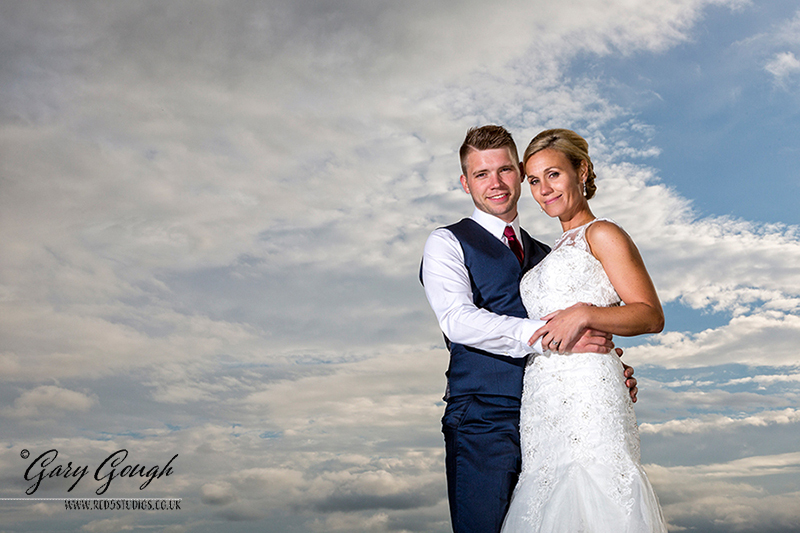 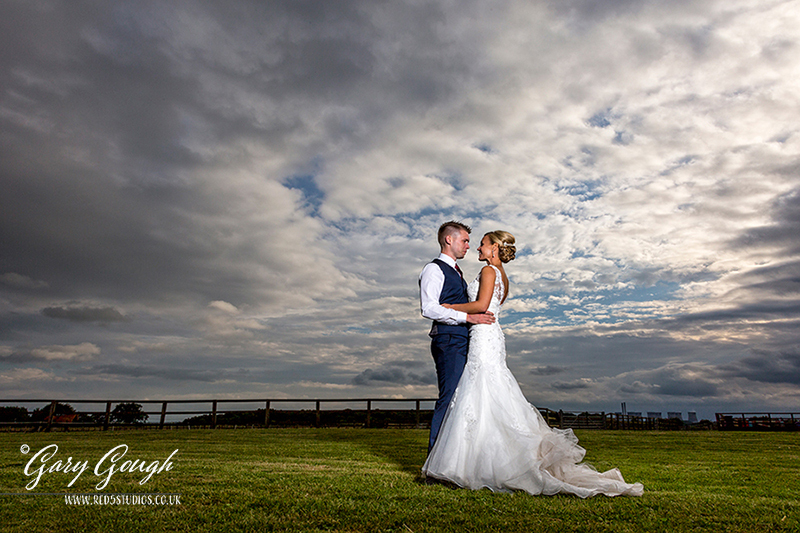 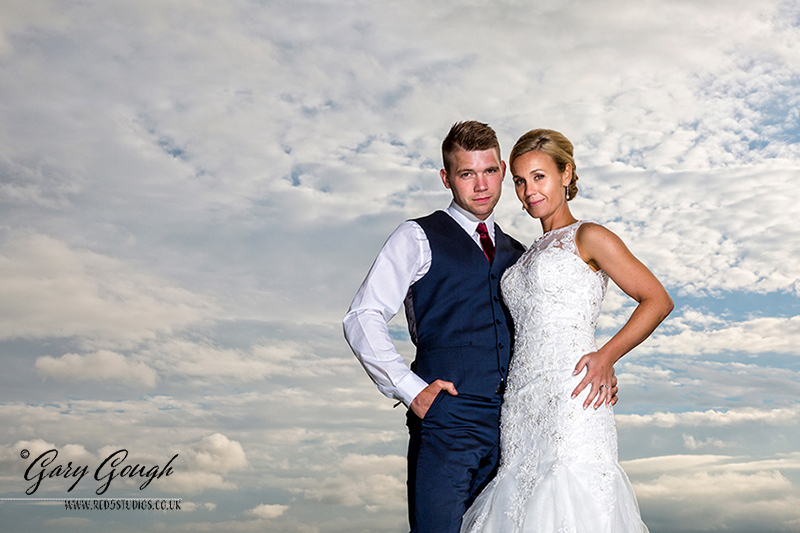 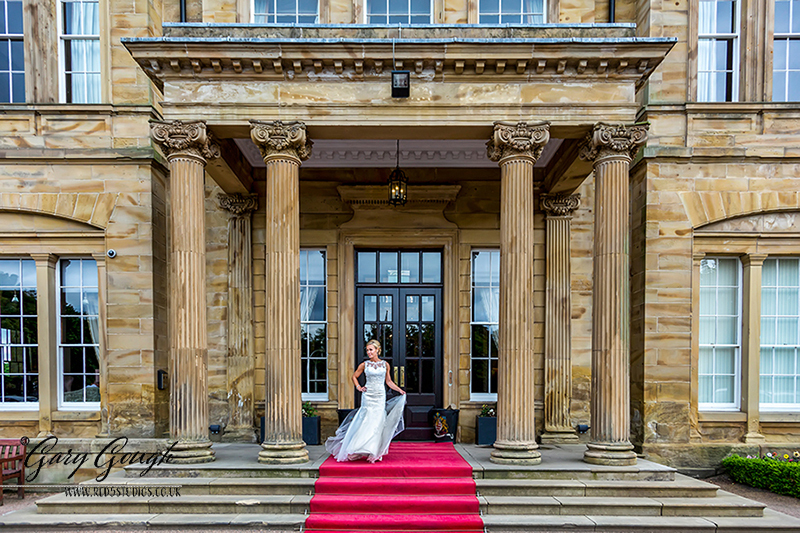 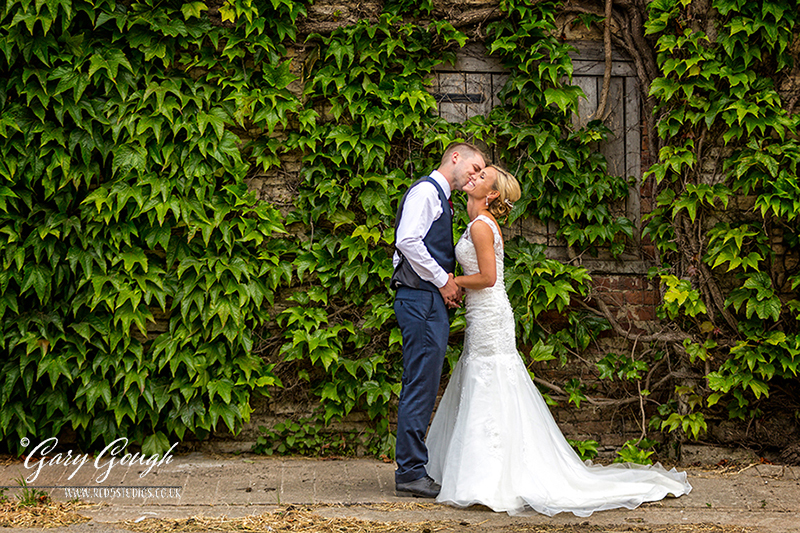 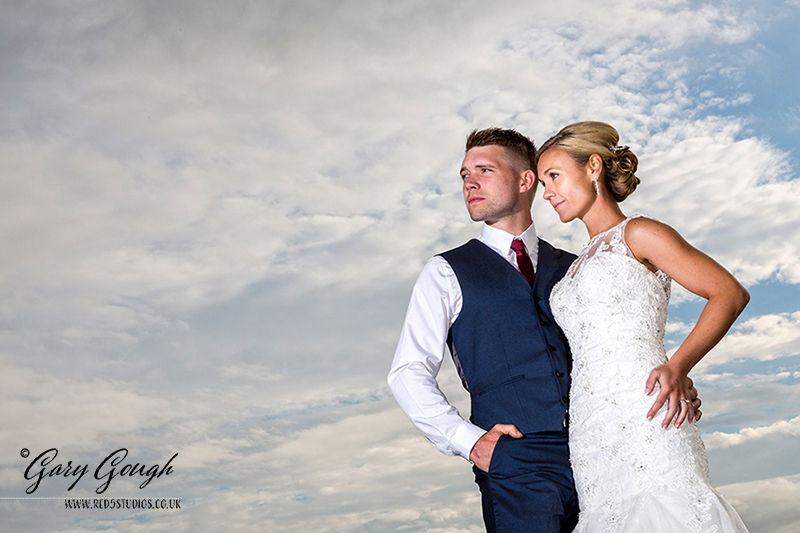 Nicola & Sam were having a great day, but when the celebrations were finished at Oulton Hall, it was time to move on to the venue for the evening party. 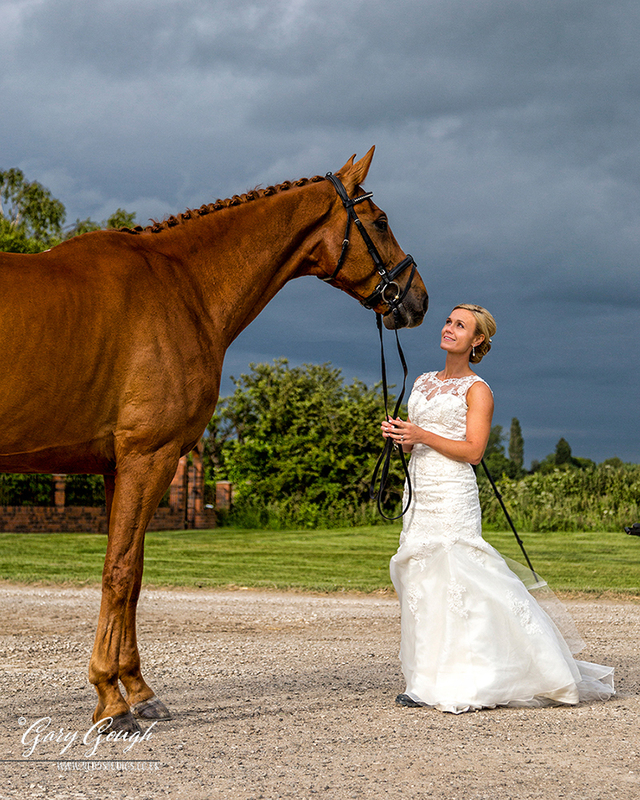 Nicola was to say at the least ‘chomping at the bit’ to arrive at Park House Farm, the reason of course was Kaiser: her beautiful, if rather large horse! 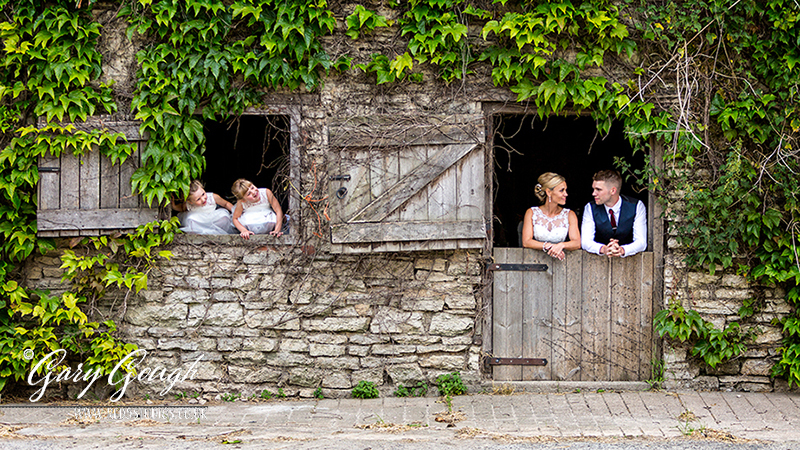 Park House farm was ready and waiting for the happy couple to arrive and so was Keiser! 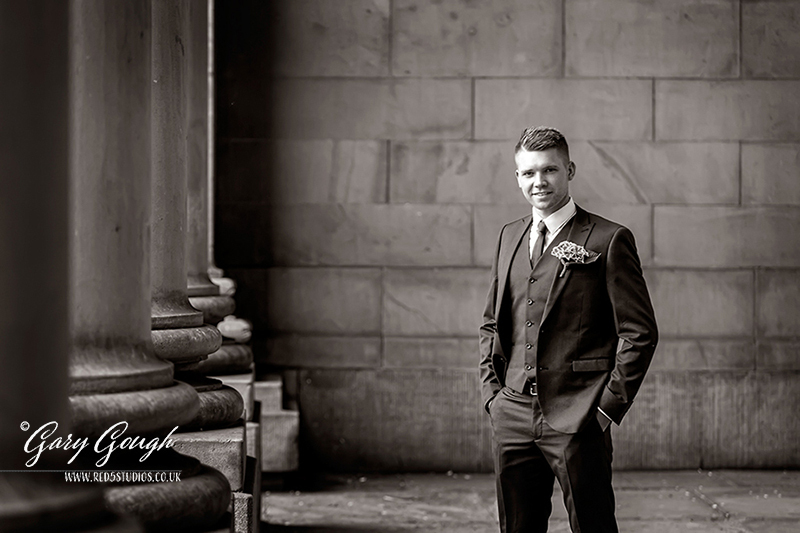 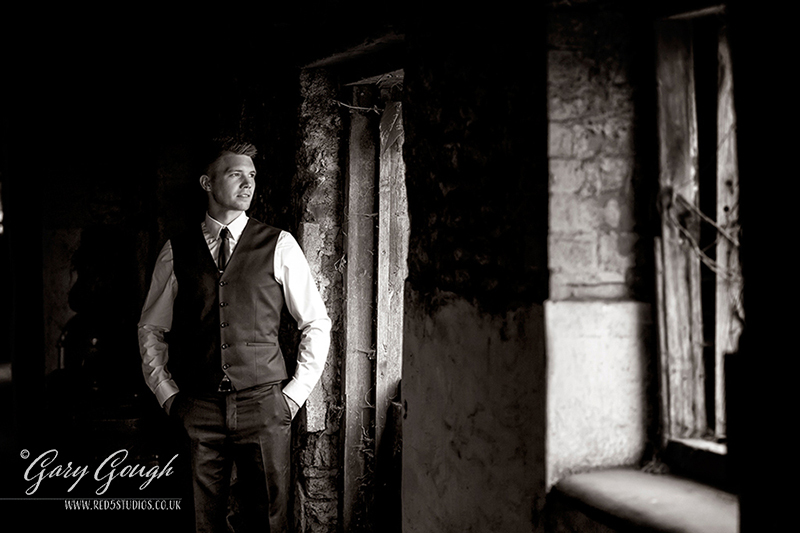 He was looking stunning, groomed to perfection he was waiting for his turn in front of the camera. 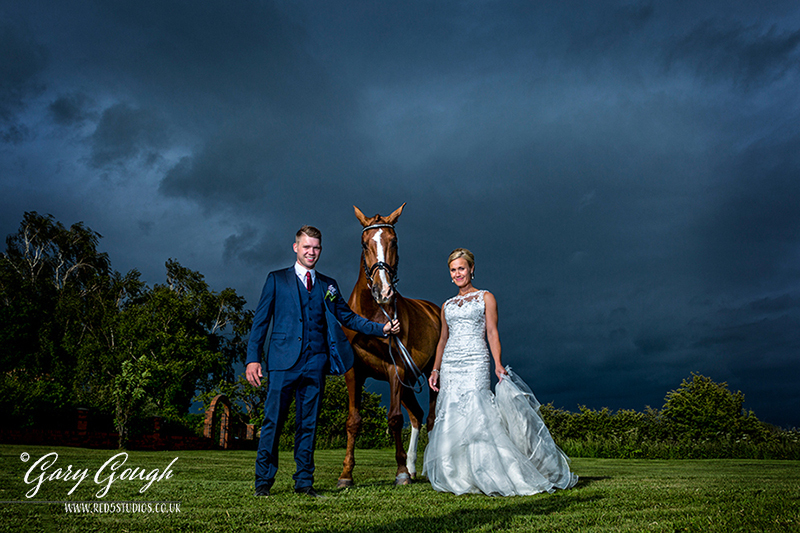 So it was off with the wedding shoes and on with the wellie’s and into the stables for Nicola & Sam, but not before a little mucking out!. 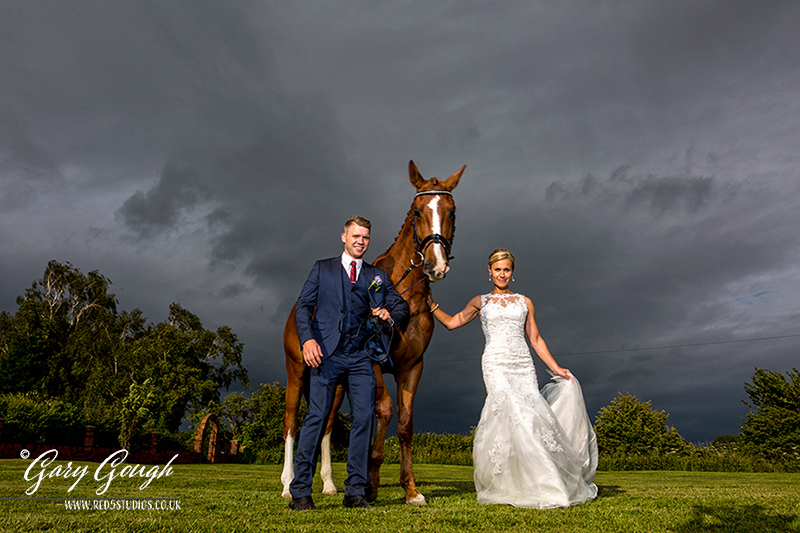 Kaiser was a little unsure of Nicola’s dress, but with plenty of hugs and kisses he was soon settled and was the perfect model... After many great shots, it was time for Kaiser to be released in out into the paddock with his little buddy for a well earned roll in the dust! 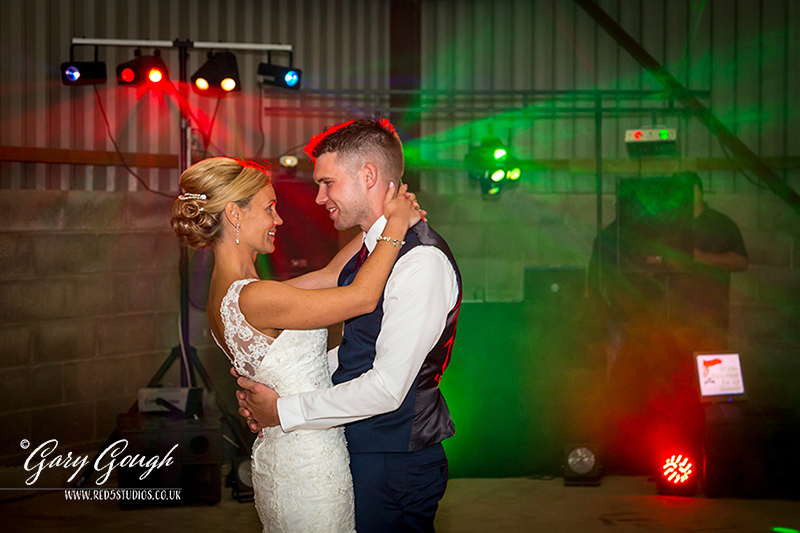 The evening guests were now arriving, the huge barn had been transformed into a great party space, complete with hay bale table and chairs, party lights, DJ, and of course a full sized bar! 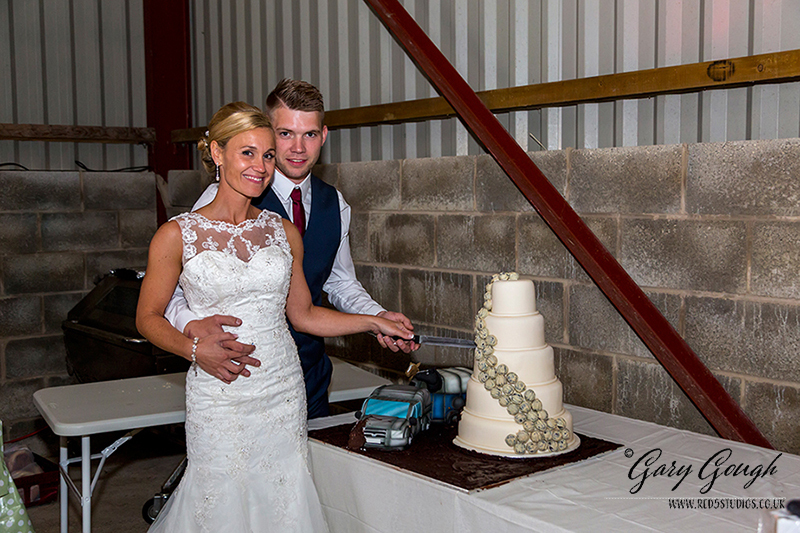 All too soon it was time for the first dance and the cutting of the very apt wedding cake. 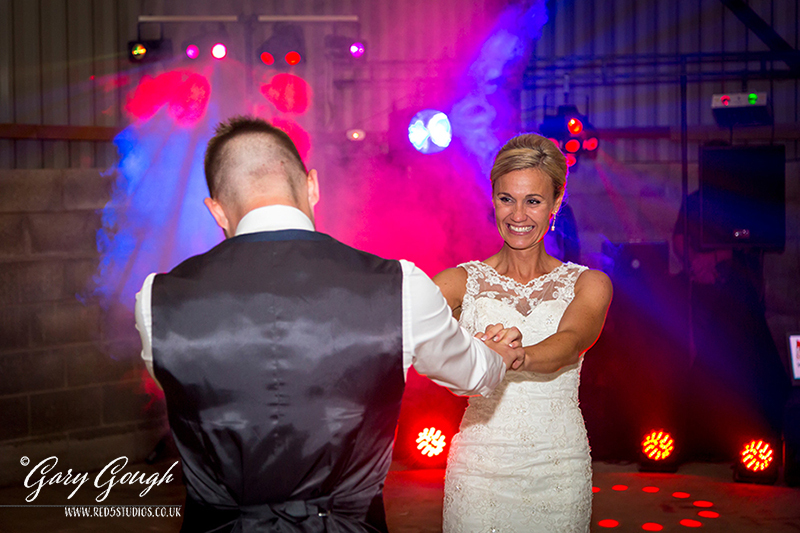 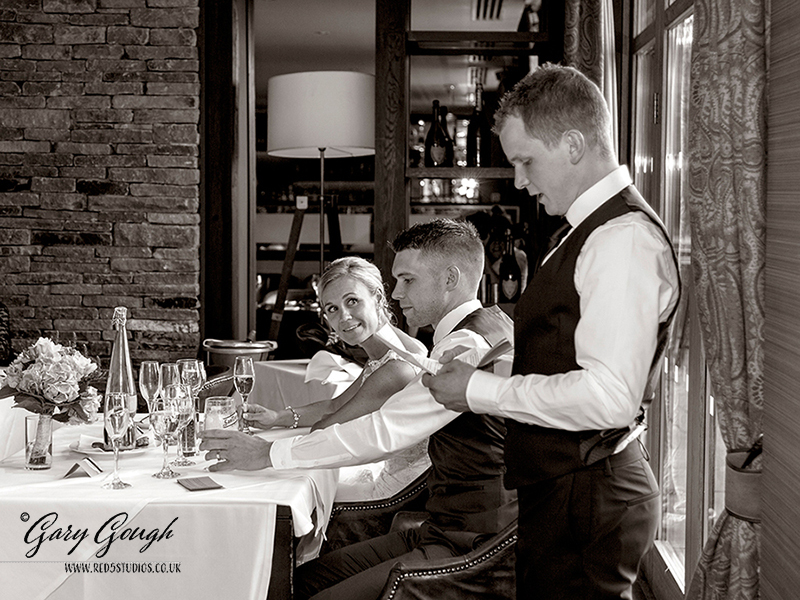 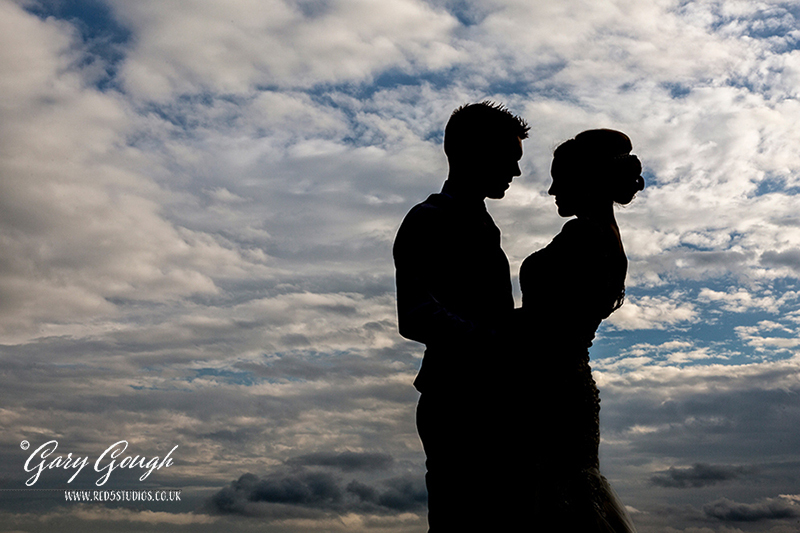 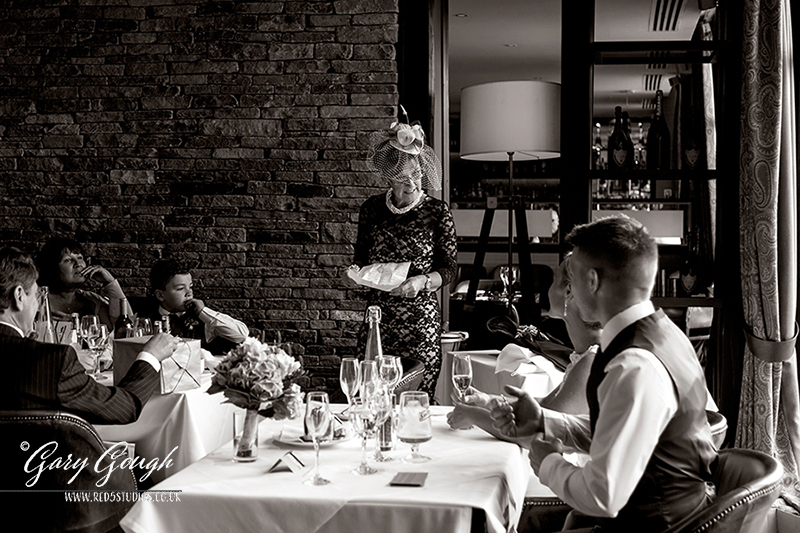 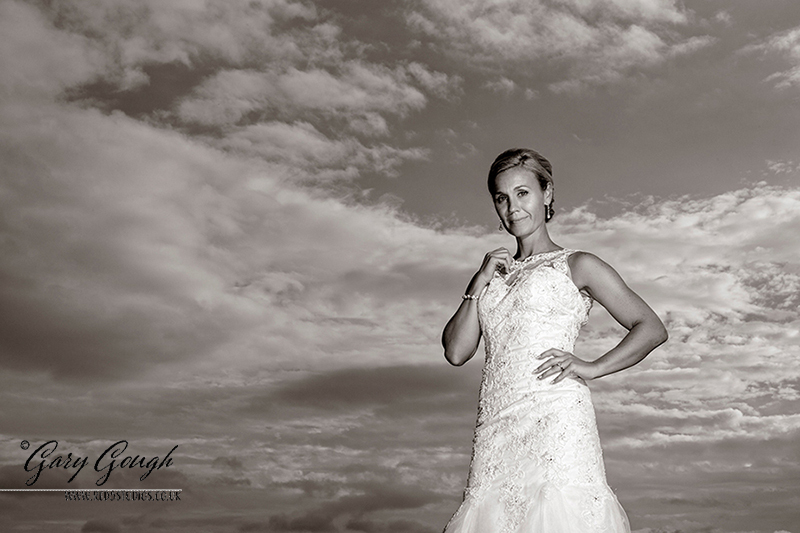 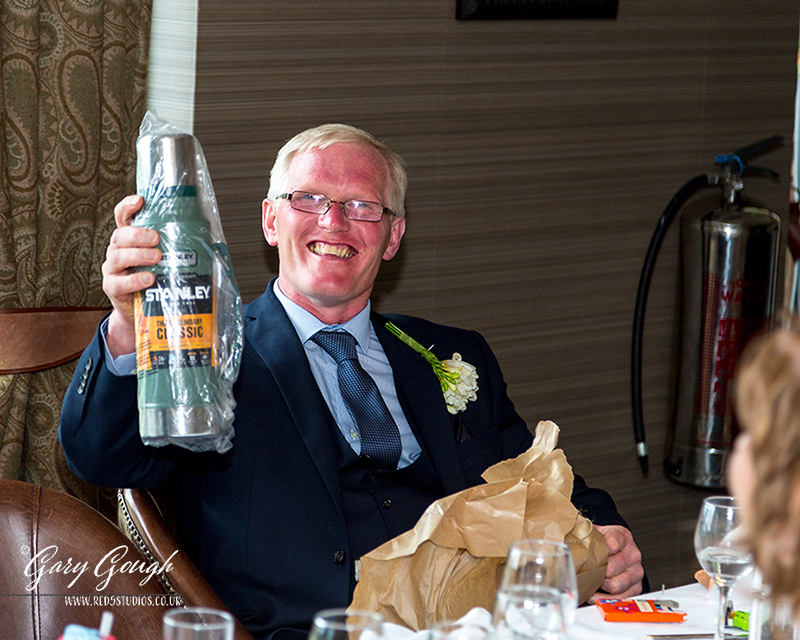 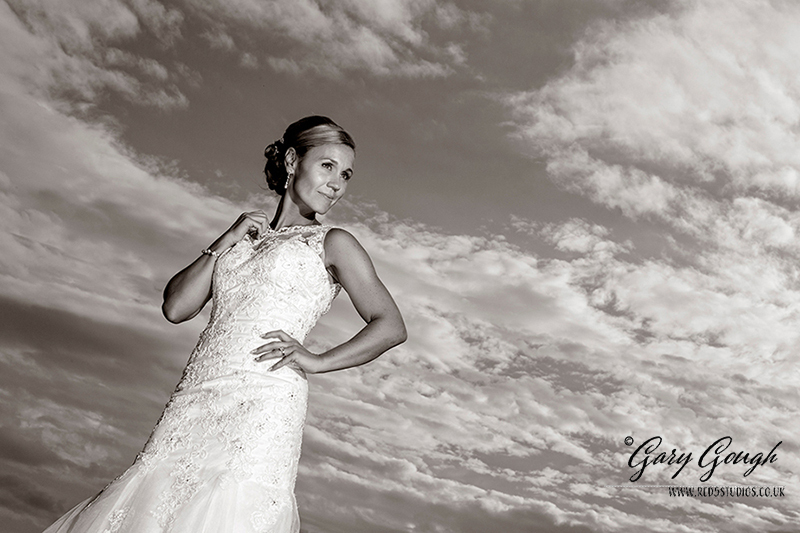 The guests were having a blast but it was time to leave the happy couple enjoying their very special day.